I have to say I am rather proud of my ceiling bulkhead in the basement ceiling. Because the main waste pipe runs the whole length of the cottage, it gets quite low at one end. That is because a minimum 1/4-inch drop per each 1-foot of run is required to achieve the right slope of the waste pipe. Over 20 feet of run means a drop of five inches . Given that the waste pipe is already almost 5 inches in diameter, the bulkhead needs to be over 10 inches at the low end. 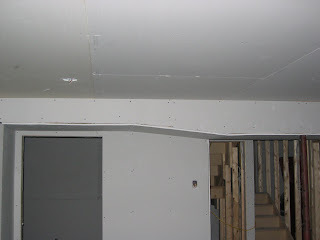 This means that the bulkhead would be below the height of one of the bedroom doors. Fortunately I was able to slope the bulkhead and hence avoid installing an extra short door. The bulkhead is used to hide the pipes and wires, but it also hides their location. In the future you will not know where they are. Place your pipes and wires at lease 1.5 inches from the walls and bottom of the bulkhead to keep them from penetrating nails and screws. Sometimes it is just not possible to place the wires and pipes out of nails reach. When that is the case use strategically placed steel plates to protect them. These plates stop nails from penetrating into wires and pipes. There is a valve, water gas or otherwise.